"The Strategic Learning cycle [taught in this program] should be mandatory for every business executive and strategist. The material was fresh, insightful, and immediately applicable to my business." Professor Willie Pietersen introduces the Strategic Learning process. In today’s dynamic world, the old static planning methods no longer work. The key to success is to create an adaptive enterprise capable of generating winning strategies and renewing those strategies as the environment changes. Implementing Winning Strategies offers a set of practical tools to achieve this kind of organizational agility. The program introduces you to the Strategic Learning Process, a unique 4-step model which has been battle tested and is being applied successfully by many global companies and not-for-profit organizations to create and implement winning strategies repeatedly over time. Strategic Learning is an insight-to-action process. 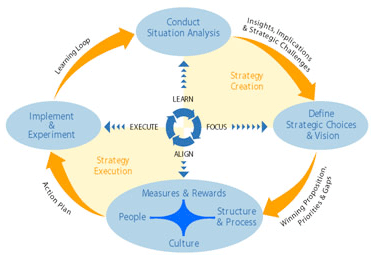 The four linked action steps move in a cycle (see picture below): 1) Learn about the external environment and your organization’s own realities; 2) Focus by making choices about where you will compete and how you will win; 3) Align your people and your business system behind your strategy; 4) Execute faster and better than your competitors. That takes the firm back to the Learn step, thus creating an ongoing cycle of learning and renewal. "Strategic Learning provided Riverside with a powerful mechanism to promote shared understanding, shared commitment and unity of action in order for us to be the best." "Working in teams, we applied the Strategic Learning Process to create superior insights into our competitive landscape and define our Winning Proposition and Key Priorities going forward. We have now significantly improved our performance and, ultimately, our brand." "Strategic Learning is the best method I have ever found for creating winning strategies." During the program you will benefit from the opportunity to apply your learning to an important personal case with the help and insight of faculty and peers. For a complete program schedule, download the agenda. Please contact our Learning Solutions Specialists at 212-854-3395 for a personal conversation to learn more. You will learn how to apply the market-tested Strategic Learning methodology: the four-step cycle designed to create and sustain winning performance. During the program, you will be given a workbook of practical tools you can use immediately upon returning to your organization. "We believe that our job is to bring you the best ideas on strategic leadership, together with powerful tools to turn them into action. That is what we aim to do in Implementing Winning Strategies." Upon completion of this program, you will earn five days towards a Certificate with select alumni and tuition benefits. Learn more. Before the program begins, participants prepare by meeting with superiors and peers to identify and document a strategic challenge. This pressing issue becomes the foundation for the participant’s personal case, which they discuss and address throughout the program by applying the Strategic Learning Process. For a complete program schedule download the agenda. Implementing Winning Strategies is designed for executives of all levels responsible for strategic planning, with primary responsibility for making the changes necessary to enable effective execution of strategy, or those with P&L responsibility who seek to become more strategic in their thinking. Alumni and up to four of their colleagues are eligible for a 25 percent tuition benefit for programs lasting up to seven days. More on the Alumni Tuition Benefit. Matthew Choy talks about how moving from a private to a public company required a more informed way to create and executive his organization’s strategy and how working on his case study with faculty and coaches at the program helped him address that challenge. Creating and Executing Breakthrough Strategy: Participant Testimonial "Being Strategic"
Matt Sheehy, Senior Director of Strategic Finance Initiatives & Communications at Carnegie Mellon University, on how he's applying the program learnings to become more strategic in his current role. "This class was one of the best learning experiences I have ever had. The teachers were able to engage everyone. It inspired me to be a better leader and help my organization understand our strengths and weaknesses in a more strategic way." Creating and Executing Breakthrough Strategy: Participant Testimonial "Jumping the Curve"
Miriam Manrique, Country Manager at Amba Research, on how she leveraged the skills acquired in this program to get her team aligned with a change in her company's strategy. Creating and Executing Breakthrough Strategy: Participant Testimonial "Strategy Best Practices"
Patrick Farrell, Head of Group Communications at the Bank of Ireland, on redefining his company's value proposition as a result of attending Columbia Business School's Implementing Winning Strategies program. "The program gave me the tools I needed to build my own strategic foundation. The way I think, plan, and execute will be different from here out." "The insights from the class go beyond the generic truths we read in business books. The faculty helped bring clarity and focus to my own real strategic challenges." "I came to Columbia with a myopic strategic disposition and left a well-structured, systematic, and strategic thinker, ready to lead change." "This program provides the tools necessary for every company to be successful. Professors who have actually run large corporations bring invaluable insight to the classroom." "Willie [Pietersen]'s matrix, the Strategic Learning Cycle, has opened my eyes to the vital role of leadership in strategy creation and execution." "I attended the program just before there was a re-organization within [my organization]. One month later, I was assigned a task to merge two areas with approximately 70 people. Willie [Pietersen]'s framework for strategic learning [taught in the program] was fundamental for getting the approval for the new structure that I thought would achieve the best results in the future. The practical application of this framework – the situation analysis coupled with strategic choices, measurable rewards, and implementation – was so successful that I used it for five years while in the same organization, many areas of which have been through one re-organization per year. Through the application of the framework, I was able to measure its success." Willie Pietersen specializes in strategy and the leadership of change. He is the originator of the Strategic Learning Process which, along with his other methods and ideas, is widely applied in numerous corporations. Over a period of twenty years, Pietersen served as the CEO of multibillion-dollar businesses such as Lever Foods, Seagram USA, Tropicana, and Sterling Winthrop’s Consumer Health Group. He has since served as a teacher and advisor to many global companies, including Aviva, Bausch & Lomb, Boeing, Chubb Corp., Deloitte, DePuy, Ericsson, ExxonMobil, Henry Schein, Inc., Novartis, SAP, and Girl Scouts of the USA. Pietersen has written several books on strategy, the latest being Strategic Learning: How to Be Smarter Than Your Competition and Turn Key Insights into Competitive Advantage (John Wiley & Sons, 2010). He has also written numerous articles which can be downloaded at www.williepietersen.com. Pietersen was raised in South Africa and received a Rhodes scholarship to Oxford University. After practicing law, he embarked on an international business career. In 1998, he was named Professor of the Practice of Management at Columbia Business School. Peter Meola has held a variety of senior executive roles in several global firms over 25 years, including Unilever, Lehn and Fink, The Seagram Company, Tropicana, Burmah Castrol, and ExxonMobil. Peter was a group executive at BP PLC (British Petroleum) and CEO of their Americas Lubricant Division, where he led a cross-cultural and cross-functional employee base with operations in more than 20 countries. Peter was an executive member of the Global Integration Team and the lead executive in the Americas following BP PLC’s successful acquisition and integration of Burmah Castrol. Meola has consulted for a number of firms, including Welch’s, ExxonMobil, Johnson & Johnson, Henry Schein, CNA Insurance, IntraLinks, Chubb Insurance, UGI, Riverside Healthcare System, United Nations Federal Credit Union, and many more. Since joining the Columbia Business School faculty, Meola’s primary areas of focus and passion have been leadership of organizational culture as well as Strategic Learning as a leadership process. He serves as a member of the Board of Trustees of St John’s Riverside Hospital, visiting lecturer at the University of Colorado’s Leeds School of Business, industry advisor for JPMorgan Chase Primary Insight & Alpha Insights, and founder of Meola Associates LLC, a strategic and organizational development advising and consulting firm. Along with Professor Pietersen and Peter Meola, additional Columbia Business School faculty contribute to and teach in the program. * Program location may vary. While the majority of our programs run on campus, some programs may run off campus in New York City.